• For quantitative determination of triglyceride and evaluation of drug effects on triglyceride metabolism. • Sensitive and accurate. Use as little as 10 μL samples. Linear detection range 0.01 to 1.0 mmol/L (0.88 to 88.5 mg/dL) triglyceride. • Triglyceride , also known as Triacyltriglyceride or Triacyl-glyceride, is the main constituent in vegetable oil and animal fats. Triglycerides play an important role as energy sources and transporters of dietary fat. In the human body, high levels of triglycerides in the bloodstream have been linked to atherosclerosis, heart disease and pancreatitis. Simple, direct and automation-ready procedures for measuring triglyceride concentrations find wide applications in research and drug discovery. BioAssay Systems triglyceride assay uses a single Working Reagent that combines triglyceride hydrolysis and glycerol determination in one step, in which a dye reagent is oxidized to form a colored product. The color intensity at 570nm is directly proportional to triglyceride concentration in the sample. 1. How to extract triglycerides from tissue? 2. In a 1.5 mL Eppendorf tube, add 50 µL/mg tissue of the extraction buffer. Vortex for at least 30 sec. 3. Centrifuge 5 min at 14,000 rpm on a table centrifuge. 4. Remove supernatant, dilute 5× with dH2O and perform triglyceride assay using the ETGA-100 Kit. 2. I want to quantify triglycerides in algae and yeasts. The kit’s datasheet explains to use Triton X-100 to solubilize cells and solid components. Will this also work for Algae and Yeast? Since yeast and algae have cell walls, Triton X-100 may not be sufficient to solubilize these cells. Sigma Aldrich offers a couple reagents for lysis of yeast and plant cells which should work, although we have not tested if these reagents would interfere with the assay. Alternatively,you could try using sonication/ mechanical homogenization to disrupt the cells. 1. Tam J et al (2010). Peripheral CB1 cannabinoid receptor blockade improves cardiometabolic risk in mouse models of obesity. J Clin Invest. 120(8):2953-66. Assay: Triglyceride in Mouse primary hepatocytes (Pubmed). 2. Tucci, S et al (2010). Medium-chain triglycerides impair lipid metabolism and induce hepatic steatosis in very long-chain acyl-CoA dehydrogenase (VLCAD)-deficient mice. Mol Genet Metab 101(1): 40-47 . Assay: Triglyceride in Mouse Liver (Pubmed). 3. Kim HS et al (2010). Hepatic-specific disruption of SIRT6 in mice results in fatty liver formation due to enhanced glycolysis and triglyceride synthesis. Cell Metab. 12(3):224-36. Assay: Triglyceride in Human HepG2 hepatocellular carcinoma cells (Pubmed). 4. Bytautiene, E et al (2011). Prepregnancy obesity and sFlt1-induced preeclampsia in mice: developmental programming model of metabolic syndrome. Am J Obstet Gynecol 204(5):398 e1-8. Assay: Triglyceride in Cow retinal pigment epithelium (Pubmed). 5. Cylwik B et al (2012) Relationship between CDT and disease activity in rheumatoid arthritis. Z Rheumatol 71(3):220-3. Assay: Triglyceride in Rat blood (Pubmed). 6. Lee, SM et al (2008).GCG-rich tea catechins are effective in lowering cholesterol and triglyceride concentrations in hyperlipidemic rats. Lipids 43(5): 419-429. . Assay: Triglyceride in Rat plasma (Pubmed). 7. Oh TW et al (2010). Semipurified fractions from the submerged-culture broth of Agaricus blazei Murill reduce blood glucose levels in streptozotocin-induced diabetic rats. J Agric Food Chem. 58(7):4113-9. Assay: Triglyceride in Mouse blood (Pubmed). 8. Guo H et al (2011). Anthocyanin inhibits high glucose-induced hepatic mtGPAT1 activation and prevents fatty acid synthesis through PKC?. J Lipid Res. 52(5):908-22. Assay: Triglyceride in Mouse serum (Pubmed). 9. Orban T et al (2011). Retinyl ester storage particles (retinosomes) from the retinal pigmented epithelium resemble lipid droplets in other tissues. J Biol Chem. 286(19):17248-58. 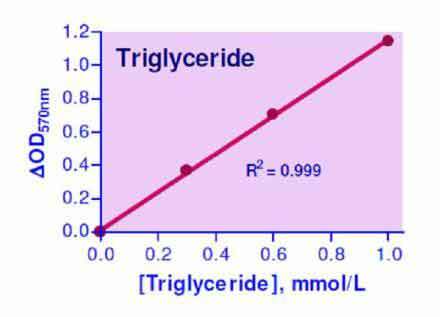 Assay: Triglyceride in Pig serum (Pubmed). 10. Uddin MJ et al (2011). Detection of quantitative trait loci affecting serum cholesterol, LDL, HDL, and triglyceride in pigs. BMC Genet.12:62. PubMed PMID: 21752294. Assay: Triglyceride in Horseshoe crab plasma (Pubmed).